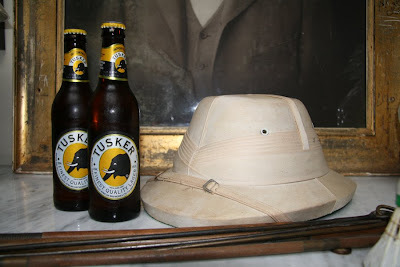 This beer has been refreshing Kenyan natives and safarists since the '20s. I discovered it last night at Whole Foods. A little late to the game, but better late than never. White settlers George and Charles Hurst started Kenya Breweries (it's now East African Breweries) in '22. A bull elephant mauled George with its tusks the next year and Tusker beer and its beautiful label were born to commemorate George's memory (ironically, it sort of does better PR for that elephant). Available by the bottle at Whole Foods on Houston. Does it make me completely shallow that I want to buy a six pack because it is cute? I love beer above all other beverages, so in all fairness my official reason for purchase would be for a tasting. Hopefully, I can find it somewhere in the ATL. Hmmm, in Cameroon it was the Guinness truck that got through when even the mail was delayed. I lived on nothing but for two days once.